Every seller expects to haggle at a boot fair so it’s only natural that you should expect to pay a bit less than the asking price. If you cannot agree on a price when initially haggling and you don’t mind risking someone else buying it then you can come back to that stall later and try again. Remember, the closer you get to the end of that day’s boot fair, the better the chance that the seller will let it go for a lower price. At least the night before, know which boot fair(s) you will be going to and plan the route, especially if you haven’t been there before. Also, make sure that you have enough petrol in your car as it’s better than having to get it on the way there. All of these things will save you time and stress on the morning of the boot fair which means that you will get there earlier, which increases your chances of buying the best things on sale for a good price. No one likes someone who is unfriendly an argumentative at a boot fair. Ultimately, people are there to get rid of their unwanted items, make some money and have a laugh. If you have a good relationship with sellers and the organisers then you will enjoy it more and will give yourself a better chance of getting some good deals. Another benefit of having a good relationship with people there is that they will be more likely to tell you about the good items they have or have heard that other sellers have and people will be more likely to give you a lower price than if you are unfriendly and confrontational. 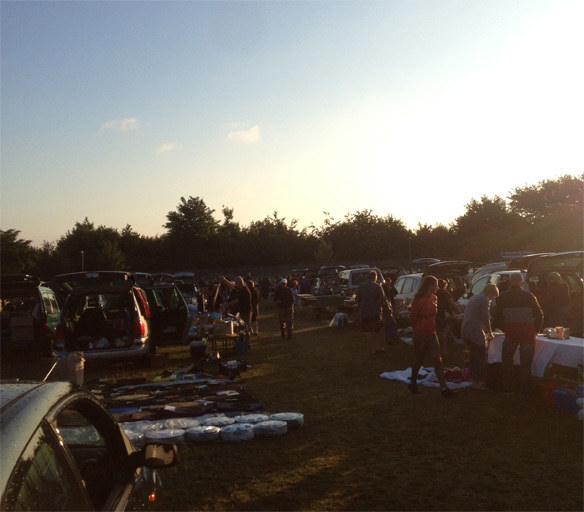 Boot fairs start early anyway but many of the best deals will be available when people start to around which can be around the 5:30am-6am mark. People will be getting their stuff out of their cars so all of the best items will be available then. If you arrive later than this it is quite likely that the best items that people have brought with them will already have been sold. It is quite common for people to be asking sellers what they have with them even before they’ve got it out of their cars such is the motivation that people have to get their early and bag the bargains. A lot of sellers will not have carrier bags that they can give you when selling so it’s a good idea to take your own, especially if you will be buying larger items. Remember, the weather can turn very quickly so even if the forecast is for sun there can be a downpour which may ruin the items that you buy if they get wet. Like with bags, sellers may not have a huge amount of change that they can hand out. Paying for a cheap CD with a £20 note is probably not feasible at a boot fair so you will be maximising your chances of getting a bargain if you have the right change with you to buy with. As mentioned above, the weather can turn to rain rather quickly so make sure that you have the right clothing and footwear to cope with it. Even if you just leave them in the car, it’s a good idea to take a jacket, hat, umbrella and some boots with you to a boot fair. As they are mostly on fields, the rain can make the ground turn muddy very quickly. When it rains, sellers will often want to head home very quickly which is an opportunity to get bargains as they may be desperate to sell. If you’re prepared for the rain you can keep looking for longer than your competing buyers!